Operation Nomad is the South Australia Police (SAPOL) response to the threat of bushfires in South Australia, supporting the work of the Country Fire Service (CFS) in preventing bushfires this summer. 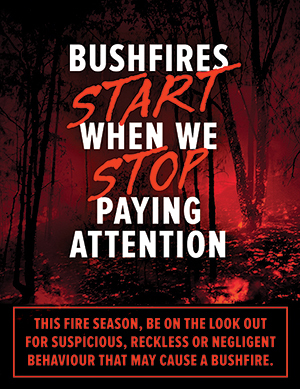 SAPOL has commenced this year’s crime prevention strategy which aims to encourage the public to identify and report to police deliberate, reckless and negligent acts that cause bushfires. Community means the whole state and people venturing into or through high risk fire areas as everyone can play a part in reporting deliberate, reckless or negligent behaviour. What you will see from now through to May 2019 is a high visibility of police in all high fire risk areas. Police will also be actively monitoring would-be arsonists and demonstrating a zero tolerance approach to any breach of fire laws throughout this period. Penalties of up to $10,000 and two years’ jail or on-the-spot fines of up to $315 may be enforced if Total Fire Ban conditions are not met. With the assistance of the public and the efforts of police, people who start fires are already being caught. Monday, 12 November 2018 was declared a Severe Fire Danger Day in the Mount Lofty Ranges and a Total Fire Ban was issued. On this day a woman at Carey Gully was reported for lighting a rubbish fire and a Crafers man was also reported for lighting a rubbish fire in a separate incident. A Currency Creek man was reported for lighting a camp fire, and a Bridgewater man was reported for using a chain saw during a total fire ban. These examples highlight that you need to be vigilant and know the Fire Danger Ratings and what you can and can’t do during the fire danger season. It also shows how the police and firefighters rely on the quick action of the public to prevent and control bushfires and apprehend those who don’t do the right thing. anyone else present or who may have also seen the behaviour. Please don’t get involved or try and stop them….….. Your safety is important to us! To spread the SAPOL message further, this year other community service groups are lending a hand. For the first time Lions, Kiwanis, Rotary and the South Australian Country Women’s Association are helping by distributing fire prevention fact sheets into their communities. If you would like SAPOL to promote this important message at your next event, please contact your local Crime Prevention Section.